Nikki Tran is a photographer, painter, pianist and puppy-mom to a Yorkipoo named Rusty. Over the last several years she has built a business as a talented wedding photographer in the Minneapolis-St. Paul area. Now, she’s decided to give up what some people would think is a dream job to return to a 9-5 life. 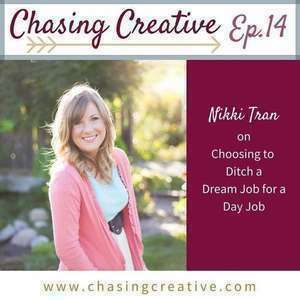 Listen in as she describes what her motivating factors are, and how she plans to make room for her creativity in this transition. We gushed about our favorite classic children’s lit as well as what books we turn to as escapist literature. What are your favorites? Tell us on Twitter with #ChasingCreative!